a couple of things happened over the past few days which made me think a lot about how Ollie has been developing and the kind of exchanges that Ollie and I have. I don’t want to say that Ollie is an easy child cos how easy a child is, is very subjective to the kind of mindset that the parent has when raising a child. I would like to say that I am a fairly easygoing person with Ollie, there are no hard and fast rules, really strict rules unless they are pertaining to his safety and well being. Ollie wakes up smiling. Every morning, he wakes up, if he sees me looking at him, he would smile groggily, roll around a little before sitting up and smiling back at me. Then he goes, “mummy, wake up”. We would then have a little cuddle before we start the day with part one of his breakfast. Breakfast is usually a 20 minute affair where we would go through some of his picture books, or he would watch what the cats are doing whilst eating his cereal, he would announce what the birds are doing outside the window (“birds tweet tweet outside window!”). Ollie would spend the first half of his breakfast self-feeding. There is just something about him lean over his bowl and spooning cereal into his mouth, then having a drink out of his mug of milk. Oh independence. Some mornings, we would read a book together, probably his favourite book which is kinda falling apart already. These days, he would “read” me the book rather than I read it to him. He is starting to notice more details in the pictures, how two similar looking characters differ by the colour of their hair. He includes reading of the page numbers as well. Other mornings, we would watch some cartoons together, or he would spend the time reading books on his own, watching cartoons whilst I go ahead with my morning household chores. But whilst we are together, he would sit next to me or between my legs on the floor, and we would have a cuddle. That closeness we share at that point in time is so precious. I can feel his excitement in looking at the pictures and describing what he thinks is going on in the picture. Did I mention nap times with him are pretty awesome too? Now that I am carrying #2, naps forces me to take a break as well and have a rest whilst I can. We still co-sleep with Ollie despite the growing lack of space in our queen sized bed. When it is just Ollie and I napping, Ollie would ramble on and on about nursery rhymes or just jabber in general. We would have a quiet hide under the blanket for a while, and then he will snuggle against my shoulder and quiet down. Ollie is very affectionate when he sleeps. He caresses our faces in his sleep, strokes our arms when he snuggles up to us and with me, he would wrap his arm around me as much as possible before settling back to sleep when he gets a little restless in his sleep. It is almost like he is using his hands to make sure we are still around when he is sleeping. My favourite part? The face caresses. Ollie loves trying to do things on his own. His little face will light up with pride and joy when he succeeds in his task. If it is a puzzle or something he is “building”, he will run up to us with the said object and show it off. Ollie also loves running into us for a hug and giggle. He may start laughing whilst running towards you. Ollie has started being aware of other emotions as well. He is starting to comprehend that others may be sad. When Donald or I give a sad face, or make an unhappy sound, Ollie will say “Daddy/Mummy cry. Ollie sayang”. If he is the one in pain, or upset, he would inform either of us what the other did, “Ollie fall down, Ollie cry. 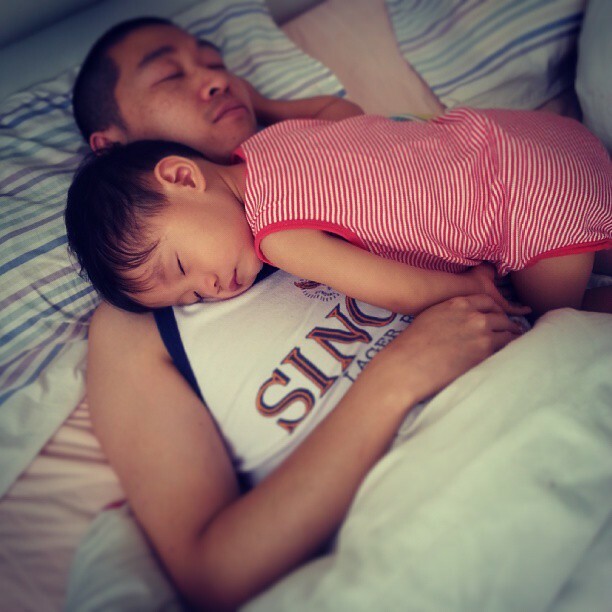 Daddy sayang.” He will always run up to either of us for a cuddle and kiss when he gets hurt and decides that it is worth making a fuss over. Other falls when playing, he usually just brushes it off. Like any other kid, Ollie loves playing. Playing with his toy vehicles, chasing around the house, hide and seek, doing activities. He is very energetic but he has his quiet moments where he is happy to sit down by his bookshelf and flip through his picture books. I have to thank a friend who introduced the idea of keeping half of his toys away so that he doesn’t get bored of all of them by some point in time. It has been a lifesaver!! Now that Ollie can talk & somewhat sing, he loves jabbering away, talking to people that is with him. He will announce what he is doing or what happened. He will make requests. He will tell you what he would like to do (“go airport!”). He loves engaging in a conversation. Donald asked if I would ever ask him to shut up. No. His jabbering beats having the television or the radio on. He cracks me up sometimes. I would never trade that for anything in the world. Donald and I do have slightly different parenting styles but I put it more to gender differences than parent differences. Earlier today, Ollie had wanted to walk when we were out and refused to hold Donald’s hand in the slightly crowded mall. Donald’s condition was that Ollie had to hold his hand, otherwise he would have to be carried. Ollie managed to squirm out of Donald’s grasp and ran towards me. I then stopped and took Ollie’s hand and said to him, “Ollie, you have to hold mummy’s hand when you are walking. Where would you like to go? Mummy will follow you.” He then gamely started leading the walk whilst holding on to my hand. He would point to where he wanted to head to and then walked in that direction. I do not want Donald and I to play good cop/bad cop. We do have regular discussions about how we communicate with Ollie, and Donald tries his best with Ollie. And Ollie knows that Daddy is more than just a playtime buddy. He is cool with Daddy soothing his hurt in Daddy’s own way. Which, in my opinion, is pretty awesome. Donald and I are pretty on par in Ollie’s eyes, except I do have a slight advantage over Donald due to the amount of time I spend with Ollie. I can say 90% of our time spent together are more happy than cranky/fussy. It is handled with a lot of love, laughter and cuddles. Donald and I have agreed that we would not like to use certain words on Ollie, words that our parents have used on us and have made us uncomfortable with using them in today’s context. Our parents probably lived on the notion of tough love. I would like to think we are raising Ollie in a gentle environment, an environment that would stand on logic, values and lots of love. The other 10% of the time, Ollie throws things around when he is upset. If he is told off for doing something that he is not supposed to do, he escalates the behaviour. If he had been tossing cat food around one pellet at a time, he would be emptying the entire dish if he is upset after being told off. Same goes with banging on doors, and emptying fluids on the ground, followed by smearing said fluid all over the floor. There are days when I am having a bad day, it takes us a couple of hours to settle back down. On most days, it takes us 15 minutes to settle back down, when I just wait and he decides that he feels really bad and all he wants is for me to hold him for a while. But things can only get better than before the tantrum. We have released our pent up frustration and we are all giggly and happy again, he is more obliging when I tell him he needs to entertain himself whilst I do some cooking. The only other people who spend a fair amount of time with him are our parents. Do I expect them to treat Ollie the way we do? Yes I do. Grandparents can spoil them but respect the way we want to raise Oliver. It is a little frustrating when our expectations and that of our parents differ due to what they know back then and what we know now. Our parents do have a tendency of saying “We did it and look, you turned out fine”. Sure, there are some values I appreciate but there are certain mindsets I do not agree with because I did not like it whilst I was growing up and definitely do not wish for it to be imposed on my child. Let Ollie be the child he is supposed to be. And just be a grandparent. Ollie is the way he is because of the way we let him be. If you think he is a pretty decent kid, then surely we must be doing something right. Let us be the parents. Sometimes, we know what is best for our child.